Keith was taken ill at the game but still provided his report with a great feeling for the club, as did Granville. The both of them were passionate Clarets supporters. It is worth pointing out that the two reports refer to different attendance figures. The 15,781 was the figure initially given out by Burnley Football Club but they later corrected this to 17,600. It is widely believed that neither of these figures are any near accurate and certainly with the lack of room on the Longside and Bee Hole End the attendance was probably considerably more than either of these two figures. Not even the scenes following Burnley's First Division championship triumph 25 years ago could match those at Turf Moor on Saturday when, after 90 minutes that seemed more like 900, the Clarets finally avoided the threat of losing their Football League status. An afternoon of unbelievable tension began with the police asking referee George Courtney to bring the players off the pitch from their pre-match warm-up to delay the kick-off 15 minutes to allow thousands still outside the ground to get in. And when the match finally started at 3.15 p.m., there were 15,781 fans inside, the largest attendance at a Burnley League game for five years, since they won the Third Division championship. With Orient also needing to win - but for a far happier reason than the Clarets - the match began at a furious tempo with both sides having a goal-scoring effort cleared off the respective goal lines in the opening two minutes. 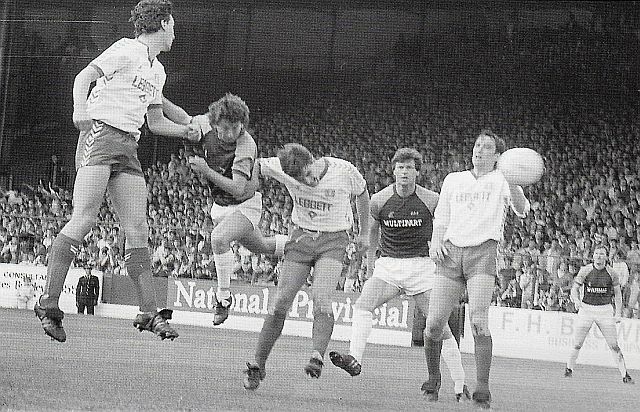 It was the Burnley fans' turn first to hold their breaths as a header from Orient's Terry Howard got past goalkeeper Joe Neenan only to be headed off the line by Peter Leebrook. And as play swept to the other end, the Clarets won a corner through Ian Britton. When this was sent over from the right, Joe Gallacher got above the visitors' defence to power in a header which full-back Kevin Hales booted off the line with goalkeeper David Cass beaten. That was the pattern to be followed with Gallacher lunging at a cross from Leighton James and failing to connect by inches as the ball even then almost found the far corner of the net. Neenan needed his full height and then his fingertips to prevent a cross from Kevin Godfrey finding the lurking Chris Jones while in an immediate counter attack by the Clarets, Phil Malley met Billy Rodaway's cross to send a flashing header inches over the bar. James almost caught Cass napping with a clever overhead kick following Gallacher's header from a free-kick by Peter Hampton before Gallacher, back in his own position as central defender, came so very close to giving Orient the vital first goal. His headed back-pass to Neenan went sadly wrong, Godfrey pounced and only a desperate lunge by Ray Deakin averted disaster, but not before the ball had screwed off his foot and shaved the angle of post and crossbar. Malley went desperately close from Neil Grewcock's pass, John Cornwell was just as near to breaking the deadlock following a right-wing raid, and then, in injury time in the first-half, the ground erupted. Britton made the break down the right, found GREWCOCK, who cut inside and then, from twenty yards, sent a left-foot drive just inside the far post past the diving but well-beaten Cass. With news coming through that Swansea were beating Lincoln, the Clarets seemed to have won their own battle three minutes into the second half when Grewcock's perfect free-kick was headed home by BRITTON, the smallest player on the park. But if the delirious Burnley fans thought that was it, they were in for another half-hour of nerve-jangling tension as Orient became more and more dangerous and Burnley's efforts began to show on some ageing and even young legs in the side. We had seen it before this season - the Clarets ahead and counting the points but then failing dismally to get any at all. And when Neenan came out to punch away a right-wing cross and only succeeded in giving it to Allan COMFORT, the tricky Orient winger volleyed into the roof of the net after 56 minutes and the fight for survival became even more intense. Britton could have eased the tension after 65 minutes when he swept a cross from Phil Devaney wide instead of into the corner of the net, but it remained with the Clarets having to defend desperately. Every catch by Neenan was greeted with tumultuous applause, every desperate tackle by a Burnley player produced roars of approval. Hearts missed a beat or two as Malley hurled himself to block a goal-bound effort from John Cornwell, and Neenan dropped on a shot from the rebound from the dangerous and gifted Orient star Shaun Brooks. The crowd willed the ball away from Burnley's half and into Orient's, and Grewcock hit a post as the minutes ticked away, ever so slowly, it appeared to the Burnley fans. Within seconds of Mr Courtney signalling it was all over, Burnley players disappeared under a sea of fans who invaded the pitch. They danced a conga, the respective fans finally applauded each other, and the Clarets reached the dressing room with only two shirts intact - those of Deakin and Leebrook. Skipper Deakin won the man-of-the-match award from sponsors Gilbraith Commercials, and it was presented to him by former Burnley star Alex Elder who said, "He led by example and experience." But after so many disappointments this season, all eleven Burnley players were acclaimed as heroes with the least experienced, 18 year-old Phil Devaney, having run himself to a standstill. Hardly known by the Burnley fans six weeks ago, he has been pitched into the deep end, grasped the chance brilliantly and is one Burnley player who will probably look back in years to come and remember the season as a happy one. Some others won't and neither will the fans, certainly not the 2,000 or so regular loyalists who will now rightfully demand THIS MUST NEVER BE ALLOWED TO HAPPEN AGAIN! Neil Grewcock and Ian Britton will never be forgotten by Burnley fans after the goals they scored in this historic Turf Moor match to keep the club in the Football League. Stockily-built winger Grewcock gave the Clarets a survival lifeline with a brilliant strike a minute before half-time beating three defenders in a brilliant crossfield run before hammering the ball past goalkeeper David Cass. And when the former Leicester player hoisted over a free-kick in the third minute of the second half, Britton, the smallest man on the field, scored a rare headed goal to send supporters wild with delight. But Grewcock and Britton were not by any means the only heroes of an epic game won by battling Burnley in front of a 17,600 crowd, who paid receipts of £42,000. So many people wanted to get into the ground to witness what could have been the Clarets' final Football League fixture that the start was delayed 15 minutes. The team as a whole dismissed all thoughts of a nightmare season and of threatened oblivion to produce a brave, big-hearted performance that brought them exactly the result they wanted. Nobody made a bigger contribution than Deakin, courageous at the heart of the defence, while the two youngest members of the side – right back Peter Leebrook and striker Phil Devaney, fought as never before during 90 minutes of agony and ecstasy. It looked all over when Britton flicked in that second goal, but talented Orient left winger Alan Comfort had other ideas and was deter stick to the script. In the 56th Joe Neenan missed a centre by Kevin Hales, and Comfort cracked a first time effort high into the net to make it 2-1. . The last half-hour intolerably tense as Burnley hung grimly on to their slim lead, aware from the reaction of the crowd that things were going wrong for Torquay and Lincoln in their crucial matches against Crewe and Swansea. But when Spennymoor referee George Courtney brought it all to a merciful conclusion with Burnley still in front, that was the signal for a joyful pitch invasion the like of which has not been seen at Turf Moor for many a day. Make no mistake, the Clarets won on merit in their most vital ever fixture, but that scoreline just might have been different. Leebrook cleared off the line early in the match, a misjudgement with a header by Joe Gallagher led to the alert Deakin turning Kevin Godfrey's shot against the woodwork and in the closing stages Burnley lived very dangerously again. But against this, they scored two good goals when the pressure was right on them, and could easily have had several more against an Orient defence that did not always appear comfortable. Britton and Gallagher went close early on, Cass saved an excellent overhead shot by Leighton James, who then laid on an opening for Phil Malley, but his snatched drive flew narrowly wide. Grewcock, such a prominent member of the attack on this occasion, sent a late effort against a post after laying on a perfect pass to Britton, whose swerving shot went just outside a post with Cass struggling to cover the bottom corner of his net. The way the players responded to the challenge of what had become the most important fixture in the club's 105-year history was truly magnificent and they deserved all the praise heaped on them afterwards. It made quite a contrast to the wooden display against, for instance, Cardiff at Ninian Park, but a very hard lesson has been learned. Burnley must never again be permitted to get so low so late in the season. It was a near-miracle that they survived at all, and there can be no doubt, that their supporters played a key role. Grewcock and Britton scored the goals, but all 11 players get the merited appreciation of club and fans for their terrific; never-say-die approach which pulled Burnley to safety at their darkest hour. BURNLEY: Neenan 6, Leebrook 7, Hampton 6, Rodaway 6, Gallagher, 6, Deakin 8, Grewcock 8, Malley 7, James 6, Devaney 6, Britton 7.Sub: Hoskin (not used). ORIENT: Cass, Cunningham, Hales, Smalley, Howard, Cornwell, Hughton, Brooks, Jones, Godfrey, Comfort. Sub: Castle (not used).